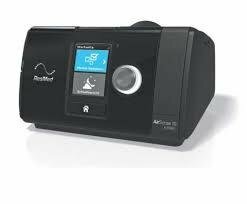 The ResMed AirSense 10 AutoSet is a premium auto-adjusting pressure therapy device that automatically adjusts pressure levels to fit your changing needs and to ensure you’re receiving the lowest pressure necessary. Intelligent detection - AutoRamp™ with sleep onset detection starts by delivering a low pressure for greater patient comfort. Then, after you fall asleep, it gradually increases the pressure to the prescribed level. Built-in ambient light sensor -The light level of the screen adjusts to the brightness of the room. So if you need to get up during the night, the screen’s back light won’t disrupt your bed partner. Easy-Breathe motor - This machine's motor whisper-quiet, offering you and your bed partner a more peaceful night’s sleep. The SmartStart™ function - The SmartStart function begins your sleep apnea therapy as soon as you breathe into your mask. When you remove your mask, it stops automatically after a few seconds. Consistent humidification for increased comfort throughout the night with the integrated HumidAir™ humidifier. Add a ClimateLineAir™ heated tube to experience Climate Control technology, providing the ultimate in comfort.